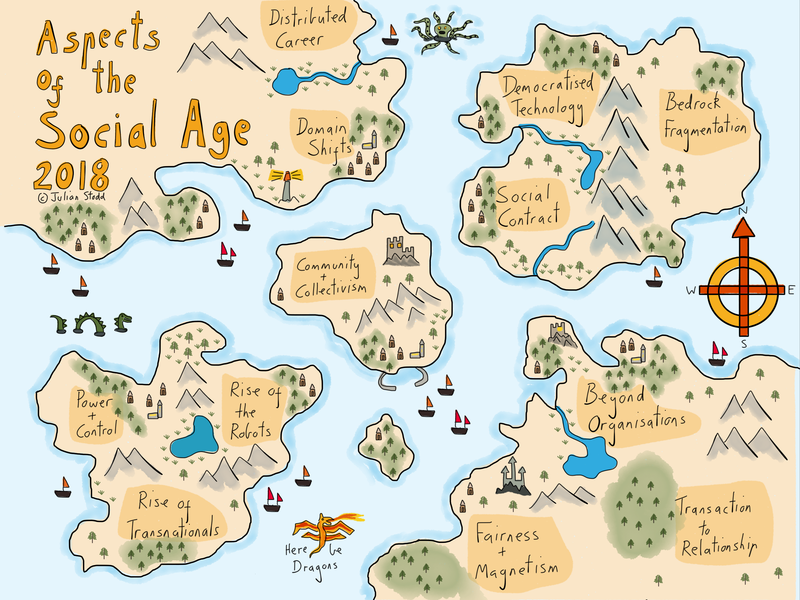 At the start of every year, i redraw the map of the Social Age, to reflect my current understanding of the landscape. But every year remains a sketch map: this is an evolving landscape, like the face of a glacier. The surface is ever changing, with giant cracks opening and closing, and the whole things in constant motion. Indeed, also like a glacier, it’s unfeasibly large, and easy to convince ourselves that it’s static, that no force could shift it. But still it grinds on. 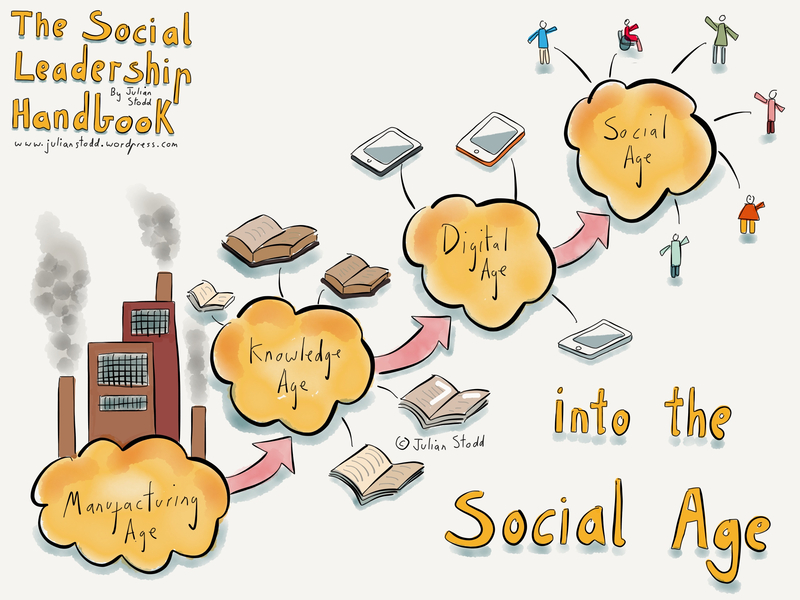 The Social Age is the context of society, the backdrop to our Organisations, and government. The backdrop to our structures of learning, leadership, culture, and change. Our ability to understand it will not give us a perfect ability to predict effects, but it will give us our most probable chance of adapting. To deconstruct the old, and innovate the new Organisations that we will need, to thrive. I will typically describe the broad thrust of the Social Age in two central concepts: radical connectivity, and democratised infrastructure. Today, we are connected in many different ways, almost all of which exist outside of any formal oversight or control. And both our tribal structures, and individual conversations, flow through multiple of these connected spaces. We still have formal structures of connection, and organisation, but these are backed up, or replaced by, prolific social ones. And this brings us almost immediately to a central theme, that the Social Age is multi dimensional: whilst the formal structure is understood in linear terms, one interpretation at a time, the Social structure is held in multiple concurrent, and often internally conflicting, entities. Let me illustrate this: an Organisation represents one formal structure, but the internal teams, tribes, friendship groups, and alumni, all represents alternative power structures, and even they are just one more layer. The secretarial WhatsApp group is another. And so on. Infinitely regressing structures of organisation, each very ‘real’ from the inside. Almost every conversation about the evolution of Organisations involves tapping into some of the Individual Agency held within these structures: co-creation, curation, sharing, innovation, socially co-created change, all are held within the Social structure, and all will only be granted to us with permission. Whilst the Industrial Age was about materials, emergent scientific management, and hierarchies of power and control, whilst it was substantially about mastery of resource, manufacture, and distribution, the Social Age, is about communities. It’s about trust, pride, consensus and dissent, social amplification, social filtering, stories that fly, and evolving dominant narratives. In many ways, the Social Age is a time of belief, but belief invested in new ways, in new spaces. We still need the old: we need buildings, machinery, technology, and even leadership and consequence. We need rules and sanction. But it’s only half of the story. And the emergent Social power is the dominant force. The second key aspect of the Social Age is that democratisation of infrastructure: whilst this is something that used to be hard, to be complex and costly, and was almost entirely owned by Organisations, today, it’s fragmented, distributed, and available to all. Historically it was the structural Organisation that was best able to achieve effect at scale, but today it is the socially connected individual, connected at scale, and building a social movement around their core purpose. Again, don’t get me wrong: we still need Organisations, stately and grounded, but much of the effect of these is now held in systems of belief, which are rooted in the social. Just look at Elon Musk, or Tim Cook. Everything is changing: the High Street and Mall (experience vs utility), the nature of entertainment (interactive, universe based, on demand), our systems of government (must shift to synchronicity, and surplus connected at scale), healthcare (on demand, performance supporting, not by exception) and so on. When i ran the New York Dereliction Walk last year, we walked through the city, looking at the physical architecture, using it to explore the fracturing of dominant narratives, the failure of Organisations, and the repurposing of space through social movements. One aspect of that work has really stuck with me: that any dominant structure of power puts down architecture to memorialise itself. We use buildings to demonstrate our mastery and control of space, and pinnacle achievements at the top of the scales of wealth and power. And almost immediately they cast a long shadow into the past. Our success constrains us, and our ability to evolve, to adapt, is held as much in what we leave behind as it is in what we try to carry forwards. In the next week i will share my new map: not with a view to whether my understanding is holistic, or right, but to share where in this landscape i am looking. Where the cracks are opening up. Where the opportunity lies. I suggest you do the same. This entry was posted in Change and tagged Belief, Change, Control, Leadership, Map, Mapping, Social Age, Society. Bookmark the permalink.